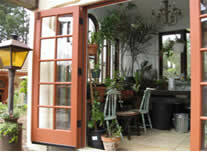 September 2008 - Master salvager Grady Harp scouted out a houseful of fabulous dual paned, wood framed windows at Last Chance Mercantile, knowing Shelly would want them for her 'dream greenhouse'. That discovery caused the revision of four years of calculating and sketching... redesigning plans that had included just a bunch of old mismatched wood framed windows. October 2008 Masonry Phase - Ground breaking! In addition to a cement foundation (to keep the dreaded gophers at bay)... the decision was made to build up with masonry walls to support the massive windows. The guys from Marzorini Masonry did a great job! 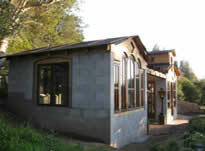 The two small buildings connected with a breezeway will be finished with stucco over faux adobe to match the look of Mission PruneTuscany. 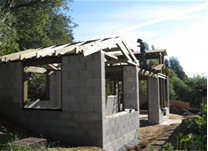 November 2008 - Wall and Roof Framing Phase -It takes shape! Sill plates, window opening, skylights... etc. Major work was accomplished during Thanksgiving week by project foreman Grady (aka 'The Gradinator'), Ranger Ray and Shelly. Changes in the design continue to be made 'on the fly'. Both buildings will now include a bank of skylights on each southern facing roof. The vision is ever changing... but always fabulous! 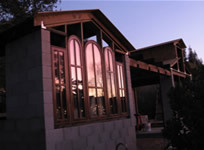 December 2008 - Window and skylight Phase - with help from Ray M., Grady and Shelly managed to get the massive windows into place. The resident cats (Rose and S.S. Pants) continue to inspect the daily progress. Ranger Ray and Grady build the custom skylights with the salvaged sunroom panels that Ray & Shelly have been storing for over a decade. PruneTuscany has had 3 inches of rain since then... and no leaks! Holidays and early 2009 - Details... Details.- The mission bell tower takes shape. Cutting and placing the styrofoam installation (which smells like the beach and is a whole lot messier). Hanging the salvaged front door. Blocking around the windows for that perfect architechtural detailing in stucco. 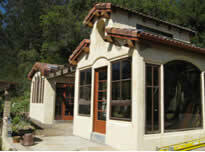 Openings for faux adobe bricks that will show through cracks in the plaster. Ray found the perfect roof tiles on craigslist.com. Dave Schroeder (Shelly's electrician father) flew up from Texas to head up the constantly evolving electrical wiring portion of the project. Cool ceiling fans, chandeliers, ambient mood lighting, and outlets galore! 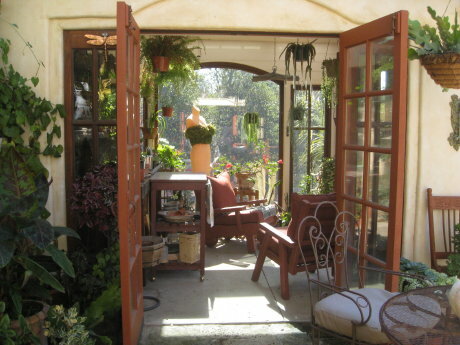 Mucho Gracias to Grady for contributing the french doors from a wall of his own greenhouse. Without his creativity, unbelievable ingenuity, and hours of hard work, this 'spectacular' project would not be possible. 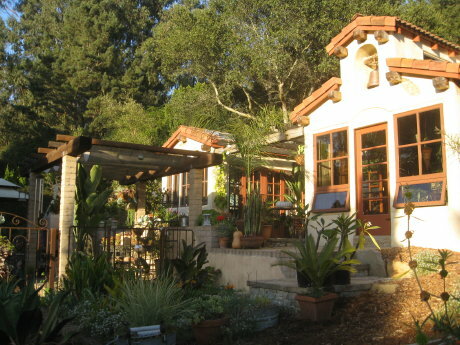 January - April 2009... - Exterior - Wrapped and wired for stucco. Put the faux adobe bricks up and grouted. The first ('scratch) coat and then the final stucco finish just in time before the rain. Doors and rafter tails get painted. Chaulking went around all those windows, doors, corbels, and rafter tails. First double coat of paint on buildings was white, followed by a color wash and faux finish. The skylights are lifted up higher and the fascia goes up on both buildings. Malibu lights under the fascia provide perfect nighttime ambiance. Gutters go up and the layer of flashing is laid on the roof before the tiles. The faux mission bell goes up in the bell tower. February - March 2009 - North Bldg Interior - Work on the exterior slows to a halt during the rainy weeks of February, so the crew moves inside. Installing hardware and sweeps on doors. Insulation and siding went up over wood framing. 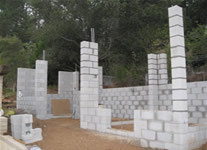 Cement block were plastered before chaulking. Thanks to Caine(aka Welder Extrodinare) who fabricated the iron shelf brackets (with assistant Ranger Ray). It looks great in there... especially after painting the ceiling and walls bright white to reflect the light. The ceiling fan and chandelier look great. Senor Limpet (the albino catfish from the indoor TV tank) gets moved into his new home. 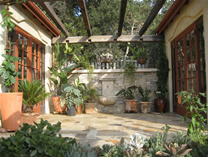 Massive stone and gravel floor goes in... and plants and furnishings follow. May - June 2009 - South Bldg Interior - After taking a break for yard work and other stuff, work began on the interior of the South Building. Styrofoam and pink insulation everywhere except windows. Frame up the inside of the bell tower and put up a window. Siding goes up along with trim. Granddaughter Taylor helps with plastering. 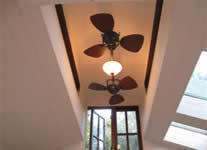 Finally the fabulous double ceiling fan is installed, along with accent lighting inside and out. Not so bright white with the paint this time... plenty of sun shines in. Gravel dumped in around the slab floor, and a big redwood bench goes in before plants and various other embellishments. September 2009 - Courtyard - the cool antique fountain goes up along with the stone veneer and wall caps. Laid dry mix slab and stone. Grouted, acid washed and sealed. Gorgeous! 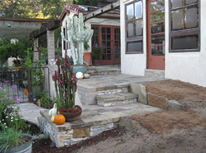 October - December 2009 Pathways - solid, gopher-proof paths with steps and a landing will last forever. Huge trailer full of soil trucked out of here, finally. Mulched to keep the dirt that's left from being washed away. Project complete!